I know, I roast a lot of chicken, but you can get a lot of mileage out of one 4-pound chicken for a family of three. We get at least one dinner, sometimes two out of the chicken, sandwiches for lunch once or twice and then I take the bones and make chicken stock so we can get even more out of it. All in all, one 4 pound chicken that might cost five or six dollars is good for 6 or 7 meals, so we certainly get out money’s worth from it. This recipe, which I got from The Daily Meal, is even better for a couple of reasons. 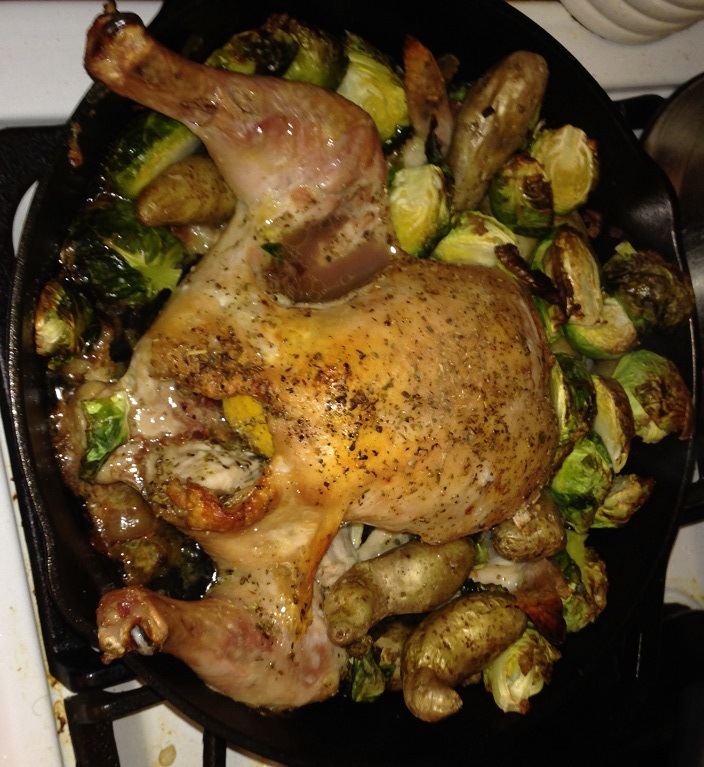 It is a one pot meal that does potatoes and Brussels sprouts with the chicken and it is in a cast-iron skillet, which is one of my favorites to cook with since they are so versatile and hold the heat so well. The original recipe for this use 2 small game hens, but I opted to go with 1 larger chicken instead. Preheat the oven to 500 degrees with the cast-iron skillet in the oven while it is pre-heating. Place the chicken on a large plate and coat the skin with 1 1/2 tablespoons of salt Place the chicken in the refrigerator, uncovered, and leave it there for 1 hour. Prior to cooking, remove the chicken from the refrigerator and thoroughly rinse the chicken with water and pat the chicken dry. Cut the skin between the legs of the chicken and gently disjoint the legs so that they lie flat on wither side of the body of the chicken. Rub the olive oil all over the chicken to coat it and then sprinkle on the herbes de Provence and sprinkle some of the herbs inside the chicken as well. Sprinkle the top of the chicken with pepper. Take the 1/2 a lemon and place it inside the cavity of the chicken. Pierce the fingerling potatoes with a fork, toss them into a medium bowl with about 1/2 an inch of water and cook the potatoes for 2 minutes on high in the microwave. Remove the cast-iron skillet from the oven and drop the bacon pieces onto 1/2 of the pan. Place the chicken, breast side up, on the other half of the skillet. Make sure to place the legs and thighs flat against the bottom of the pan. Put the skillet back into the oven and cook for 15 minutes. Remove the pan from the oven and add the fingerling potatoes, the garlic slices and the Brussels sprouts over the half of the pan with the bacon slices. Toss the potatoes and Brussels sprouts with the bacon pieces to coat them in some of the fat. Return the skillet to oven and continue roasting for about 20 to 25 minutes longer, or until the juices from the legs and thighs run clear when pierced with a fork. Remove the chicken and let it rest for 10 minutes before carving. Place the vegetables around the chicken on a platter and serve. Salting the chicken for an hour ahead of time in the refrigerator helps to dry out the skin to make it nice and crunchy. This recipe roasts the chicken at a really high temperature so it does not take as long to cook as it normally might and everything gets nice and crispy, including the potatoes and Brussels sprouts. This recipe turned out quite well and of course it is great when you can make everything all in one pot to make things even easier for you for serving and clean-up. It’s a good way to get a nice roasted chicken on the table during a busy weeknight. That’s all I have for today. Check back next time for another recipe. As always, I am always trying new things out (today I am trying my hand at making homemade challah bread), so there is always lots to share. Until next time, enjoy the rest of your day and enjoy your meal!